Last month I rambled on for ages about all the books I managed to power through. This month, I kind of lost my way a bit. You know how it is - when it's summer you want to be outdoors enjoying yourself, rather than curled up with a book which is much more of a winter activity. That's part of the reason why I only managed to get through three books in the past month, but what a variety of books they were! Even though I love reading, I have a very short attention span and find it hard to go longer than about 30 minutes without having a cheeky check of Twitter. This was one of the rare books that had my attention completely, and I read about 50% of this book in one sitting. I was intrigued from the first few pages. The story is centred on Aaron Falk, a financial investigator for the Melbourne Police. He was run out of his hometown of Kiewarra as a teenager under a cloud of suspicion regarding his involvement in the death of his school friend Ellie. Aaron had an alibi in the form of his best friend Luke, but Luke lied. Now Luke, his wife and son are dead, believed to be a murder-suicide caused by the pressures of the two-year long drought in this rural community. Aaron is back in town for the funeral, and Luke's parents ask him to investigate what happened to their son. Did Luke really kill his family? And what is the truth about Ellie's death? This is a small town with big secrets. This book had me absolutely hooked. The storyline was engaging and kept me guessing throughout, but it was the writing style that I really enjoyed. I genuinely felt like I was actually inside the story, that I could picture Kiewarra and its residents clearly. The writing is atmospheric and intense, and you really feel the pressure building within the town. Although this is marketed as a thriller, the twists and turns of the story aren't too extreme, which actually adds to the believability of the novel. Overall, I absolutely loved this. I find it hard to believe it's a debut novel because it's expertly written. I can't wait for more work from Jane Harper. With every good book, I have come to expect there will be a not so good one to follow. Unfortunately, this book just didn't appeal to me much at all. Major Pettigrew lives in an idyllic English village called Edgecombe St Mary and is the epitome of a proper English gentleman. His selfish, arrogant son might show him scant regard, and his eccentric neighbours may be on the nosy side, but he is perfectly content as a pillar of the community. When his brother dies, the Major finds comfort in a flourishing friendship with local shop owner Mrs Ali. While the two bond over literature and the loss of their partners, their relationship comes under scrutiny from disapproving family and is the subject of gossip from scandalised villagers. Can this unlikely duo find happiness together? Here's the thing - I just didn't care. I couldn't have cared less whether they ended up together because I didn't have any sympathy for any of the characters in this. While the Major and Mrs Ali are probably the least obnoxious, they are still one-dimensional and dull. However, compared to some of the locals and particularly the Major's son Roger, they were sparkling with wit and intelligence. I can't get over how much I disliked every single character in this. The Major and Mrs Ali face racism, but it's written in a way that frankly irked me. It was so over-egged and ridiculous that it completely diminished a very real issue into something utterly unbelievable. The idea was there, but in practice it became "look how racist middle class English people are!". It didn't help that this is written in the most unnecessarily pompous language throughout. I get that the Major is a 'refined English gent', but it just started to really grate on me. Also, the last quarter of the book is so unrealistic I wanted to chuck it across the room. A book that is definitely not written in pompous language! Days Without End is about Thomas McNulty, an Irish native who emigrates to America in 1850. After meeting his closest companion John Cole, the two join the US Army and fight both in the 'Indian Wars' and the Civil War. When they take in a young Native American girl, their bond is enhanced, and the possibilities of family, support and happiness seem to be within touching distance. Honestly, this story in any other author's hands would probably not have interested me. It is only with Barry's rich and lyrical writing that I found myself enjoying what was a violent and at times unlikely look at life in and out of the American army. The book is written in dialect, which definitely enhanced my 'relationship' with Thomas, and the poetic sentences had me feeling all of his emotions just as strongly as he did. It's a book that really made me think, and although it definitely will not be for everyone, I absolutely savoured it. The only slight complaint I have with this is that the ending kind of disappointed me, as it built up all my emotions to a crescendo that never came. Despite this, I found myself rooting for Thomas and his loved ones throughout. Quite an unusual selection of books this month, covering the good, the bad and the beautiful. This month's reads are shaping up to be just as eclectic! 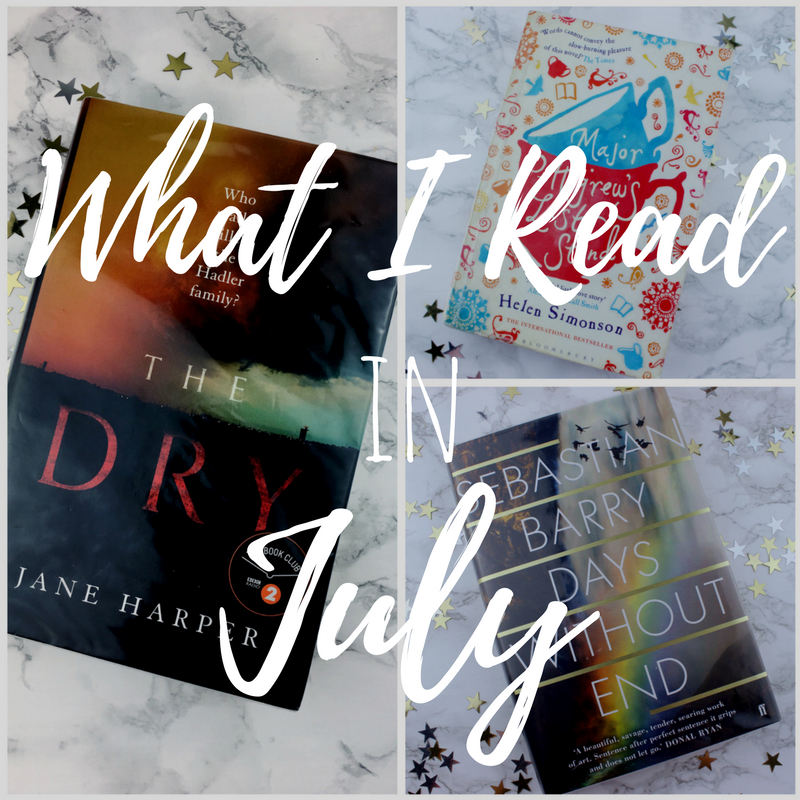 What have you read this month? Please send me your suggestions of books I might love! It's really interesting to see what books you read each month, and I want to go and read loads more books now, I haven't gt any recommendations cause I read really cliche books like Danielle Steel (romance with a twist) so if you like reading that check her out! loving the amazing use of crescendo in this post. These all look really good, especially The Dry. Will be on the lookout for it! I love your bookish posts, Beth! The Dry sounds absolutely fantastic, anything that gripping is a sure-fire winner! I am really intrigued about how the story turns out just from your description! Thank you for all these recommendations! A great selection of books. Sometimes I much prefer to read an honest review of a book someone hated rather than loved!